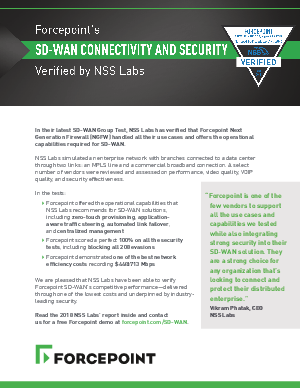 In their latest SD-WAN Group Test, NSS Labs has verified that Forcepoint Next Generation Firewall (NGFW) handled all their use cases and offers the operational capabilities required for SD-WAN. NSS Labs simulated an enterprise network with branches connected to a data center through two links: an MPLS line and a commercial broadband connection. A select number of vendors were reviewed and assessed on performance, video quality, VOIP quality, and security effectiveness.